When a whopping 90% of the salmon consumed in the US is farmed, with this farmed salmon being significantly cheaper than wild salmon and with the USDA telling me that I should be eating two servings of fish a week, it’s easy to think that eating farmed salmon is a healthy, money-saving alternative. Healthy for my wallet, healthy for me, and healthy for the environment. A lot of controversy and studies have gone into this debate over whether we should be eating wild salmon or farmed salmon but, in a lot ways, the argument can be dissolved down to a few salient points. I like to think of fish in same way I learned to think of myself in 6th grade Biology. I am a product of both my genetic make-up and the environment that I’m brought up in and, even more simply, I am what I eat. Here’s an article in the LA Times that pretty much breaks down in these terms. They’re raised crowded in pens where they are more susceptible to disease and parasites. They are fed a steady stream of antibiotics and pesticides along with their feed of pellets that consist of ground up mackerel herring, anchovies, corn, and fish oil. And, because, there pellets make their meat grey colored, they are fed a dye called Canthaxanthin to turn their meat a appealing red. And, if that’s not convincing enough for you, here’s what the fall out has looked like in our global economy. When you eat farmed salmon, this is what you’re supporting. Finally, it comes down to taste. Here’s what the folks at Cook’s Illustrated say. Do yourself, your environment, and your taste buds a favor: Eat Wild Salmon! 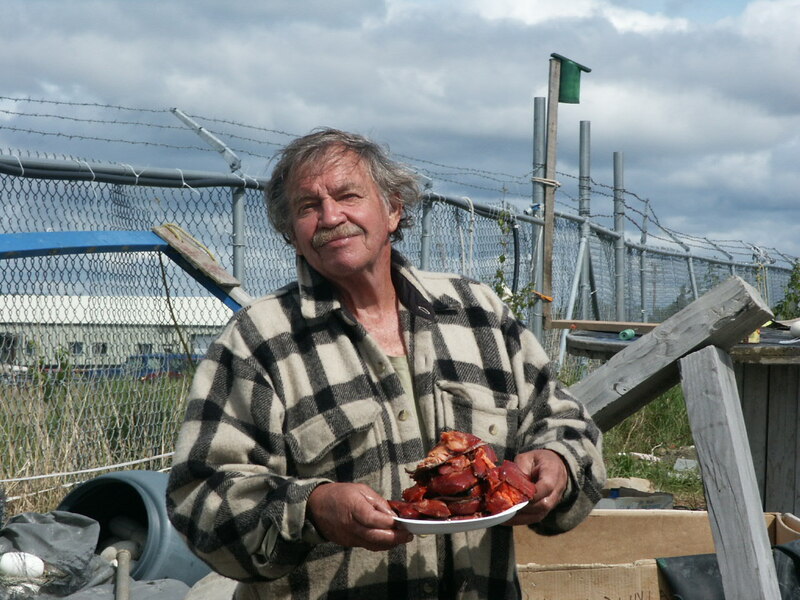 The late, great Croc Raymond with a plate of salmon smoked in an old refrigerator in the boatyard.